SNARRY SPANISH FUNNY. SNARRY SPANISH FUNNY. Wallpaper and background images in the Severus Snape club tagged: severus snape harry potter snarry. 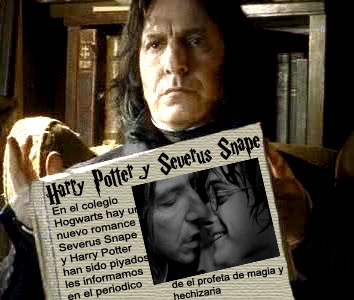 This Severus Snape fan art contains pahayagan, papel, magazine, tabloid, rag, anime, comic book, manga, and cartoon. Is there some way to get that in English...? Could someone please translate this? inquiring minds want to know!
! MAGIC unan FIGHT !